“It’s not all about you, Sharon!” the woman bluntly told me. I didn’t see that coming. One moment I was making what I thought was pleasant conversation about an upcoming reining show and the next I was quite thoroughly put in my place. Hmmm… For a moment I was taken aback. Should I answer that? Let it go? Apologize? Was she saying I was selfish? Egotistical? Did I really make it all about me? My comment preceding hers was that I wished I had a futurity horse entered at that show, a show she had quite a bit to do with. No, I didn’t deserve that. I had to respond. I defended myself, but probably not in the way she thought I would. “Actually, when I enter that pen to compete, it is all about me,” I said, “and I think most riders feel the same way. After all, we paid our entry, spent hours training our horse and got to the show. No one does all that just to donate to the show or the other riders. For those few minutes in the pen, it better be all about me - or about me, my horse and my run – or I shouldn’t be doing this.” I left it at that. 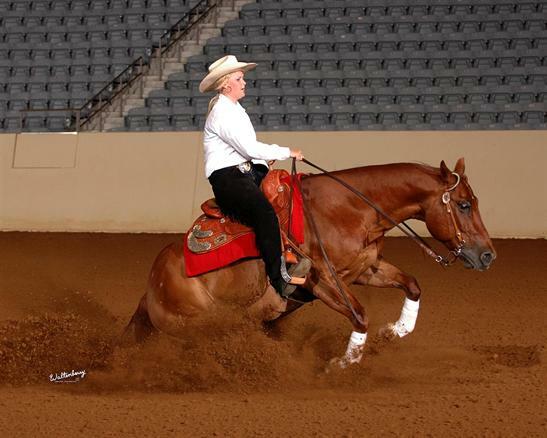 The NRHA Futurity is running now, the big one in the reining world and, although the above incident happened some time back, the significance of it stayed with me enough to come to mind now as I watch riders with so much at stake enter and leave the pen in Oklahoma. In the friendly atmosphere of competition I hope no one felt it necessary to remind them that it isn’t “all about” them. I hope their mind is 100 percent focused on themselves and the job at hand. When I first start riding my colts, I work them in one corner of the arena in a small circle. 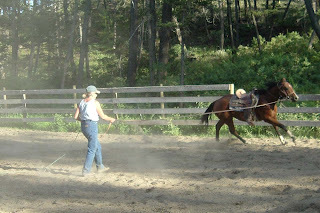 I lunge them in that circle, lunge them saddled in that circle and eventually ride them – still in that little circle! 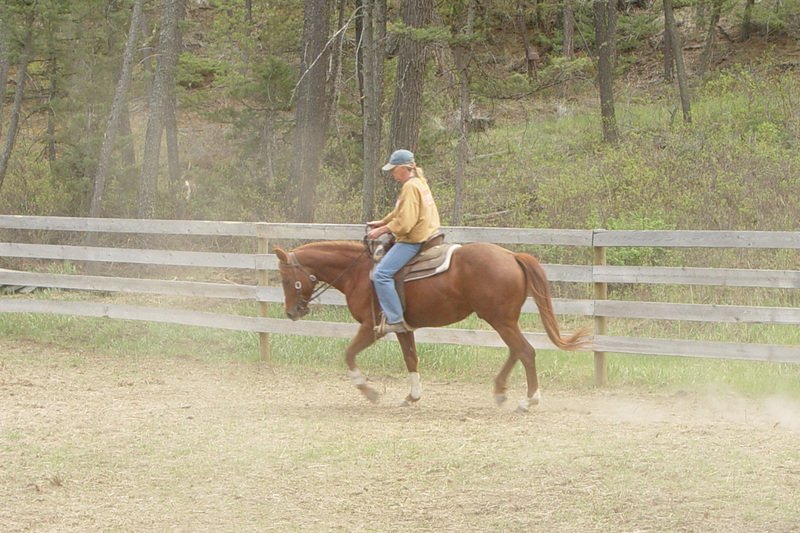 We walk, leg yield, jog, trot and lope and they develop confidence in the circle. That makes learning easier. If, when we are walking, the colt wants to jog or, if trotting, he wants to lope, I stay in that gait longer. 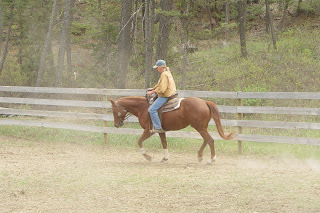 He has to “earn the right” to move at a faster gait by demonstrating patience at the gait he is in. I can maintain control that way and he learns to wait for me to ask. Gradually, I widen the circle until it covers one end of the arena. Then, at some point in this early training, I ask my colt to leave the circle and use the entire pen, making straight lines down the sides. But, since horses can get stronger and faster in straight lines than in circles, that could be where the trouble starts. If my colt cannot be controlled in a circle, he most certainly will be out of hand in a straight line. So, again, he has to "earn the right” to leave the circle or, as I have said many times to my students, he has to "earn his way out of the circle". If he tries to run off when I direct him in a straight line or will not maintain a steady gait, I take him back to the circle. I think life is a little like this. I think we have to earn the right to be respected and trusted, earn the right to venture into the world. We do have certain rights from the moment we are born – freedom of speech, freedom of religion, etc – but others are have to be earned. My "chilcotin-ization" was a gradual process, I think, one born of observation and adaptation. Over time I learned to buy bananas every time I shop for groceries (my neighbour says she doesn’t put them on the list anymore...) and I freeze milk because trips to the grocery store can be a month apart. I have collected extra parts for tractor and water bowls and have learned more than I ever wanted to know about machinery, washing machines, lawn mowers and water bowls . . . because when you live in the Chilcotin, professional help is a long way off, expensive and sometimes just not available - which is where neighbours come in. In the Chilcotin, good neighbours are gold! The beautiful Chilcotin River as seen from my kitchen window. A few months back, I held a three-day reining clinic on my property, which meant picking up the clinician, Vern Sapergia, at Williams Lake airport on Thursday evening and bringing him back to the airport on Monday morning, a 200 km return trip each time. I looked at the gauge on my truck on the first trip and decided I did not have to fill with diesel until the return trip. However, because it rained all day the day before the clinic started, all students and clinician moved to an indoor arena 10 km from my property for the first 1 ½ days. This translated into more mileage on my truck than I anticipated and on Saturday, when Mandy, a friend of mine from the Okanagan, returned to the house in my truck with the clinician for lunch, she voiced concern that there was not enough fuel for the trip to the airport on Monday. “Is the light on?” I asked, meaning the fuel light. She gave me a look with that clearly said, “What’s that got to do with it?” but replied that it was not. I told her I thought I was all right, but she persisted so I promised to get some diesel before Monday morning. On Sunday evening, after the clinic was completed, Vern, Mandy and I headed out for an impromptu barbecue at Chilco Ranch, just across the river – in my truck. We had planned to dine out, but there was nothing open after 7:00 AM (the Chicotin way…) so Crystal and Jordan offered to host dinner (also the Chilcotin way…) Of course, the gas station was closed as well. “I’m sure Jordan will sell me some diesel,” I told Mandy. “Is the light on?” he asked. Mandy doubled over with laughter. The rest of the table looked a little confused at her reaction. When she could talk, she explained that I had asked the exact same question when she told me I was low on fuel. 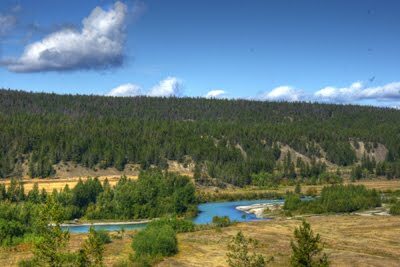 “Must be a Chilcotin thing,” she said. It’s been a tough week. Two young lives on the fringe of my circle of friends have been cut short. Two beautiful young women are gone – one at the unforgiving of a brutal disease, the other at the vicious hands of a brutal killer. Although I did not know these girls personally, their passing affected me deeply. Kaylynn was a reiner, like myself. She loved her horse, loved to compete and loved life. She fought hard against the cancer that invaded her brain. She endured surgeries, treatments and pain, always living with hope and fierce determination, but the disease won. I can’t make sense of that. Taylor, much like Kaylynn, loved life, animals and friends. Having just graduated from high school, she looked to the future with hope and plans. She, unlike Kaylynn, had no reason to believe she had an evil force to conquer. But, in the time it takes to write this blog, a person or persons bludgeoned Taylor to death. I can’t make sense of that either. I phoned two of my friends living in the Taylor's home town, my former home town. Both have teenage children. Both were, not surprisingly, very emotional. I’m sure, like me, they were doing “what if’s”. We talked at some length and, although I phoned to support them, I wept myself. “If that had been your daughter,” I think I would have just lost it,” I told one. I had already spent a few days imagining how I would feel if it was one of my granddaughters. Sometimes my “picture brain” is not a good thing. I walked the walks with both these girls so many times… and with their mothers. I did not sleep. I couldn’t turn the pictures off. And so there is nothing more to say. Medical experts fight every day for a cure for cancer and still nothing. And RCMP are still looking for Taylor’s killer. The sad truth is, even if that one is taken off the streets, there are others and that makes me crazy. These two stories will be repeated in other families, other towns. I can’t say I can imagine what the families of these girls are going through because I can’t. I can only say if she were mine, I don’t think I would be still standing. The human spirit is a wonderful thing and I can only hope it’s doing it’s job. As for Kaylynn and Taylor, peace be with you, sweet girls. We will remember.